Both Bear and J-jo are avid readers. While they pick up a plethora of vocabulary words through deductive reasoning while they read, I thought it might benefit Bear to add a vocabulary curriculum to her list of things to do. Last year at the convention, I spent some time at the Dynamic Literacy booth and went home with a copy of WordBuild ® Foundations Level 2 to review. It came with a Teacher Edition and Student Activity Book. What I like about WordBuild® is that the program does not focus on drilling words and vocabulary into children but teaches them how words are built and put together. The WordBuild® program is divided into two series: Foundations and Elements. Foundations builds a vocabulary foundation with prefixes and suffixes, using the formula that a word = (prefix) + root + (suffix). Elements then takes what children have learned in Foundations and builds on it, including more complex root families, such as Greek and Latin roots. There are 5 exercises per lesson, so bear typically did one exercise per school day. 1. Prefix/Suffix square – add the prefix (and suffix if there is one) to the words in the square and then write the definition of each new word formed, using the definition of the prefix and suffix. 2. 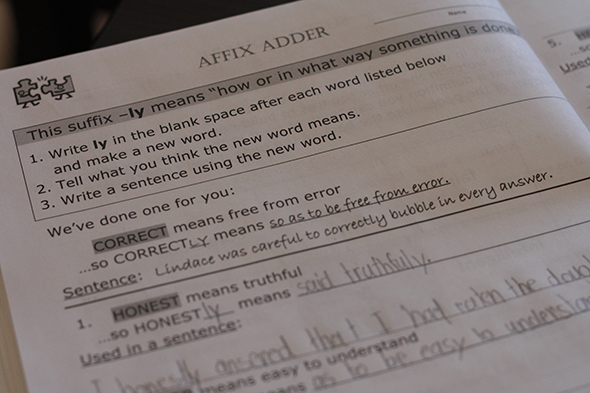 Affix Adder – Add the suffix/prefix. Write the definition, and then write a sentence showing what the word means. 3. 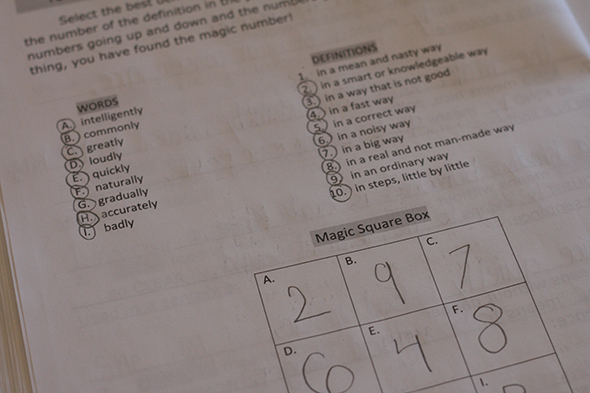 Magic Square – Match the word with the definition. 5. 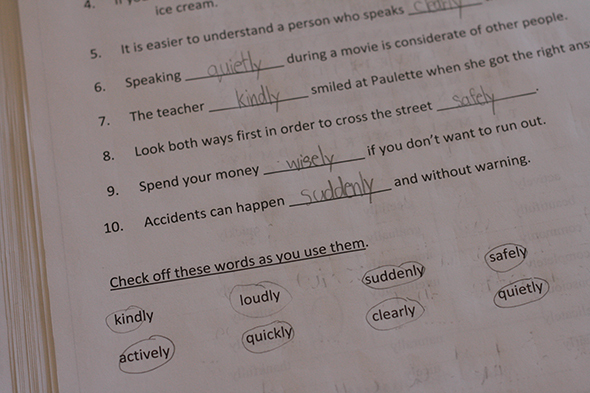 Place correct vocabulary word into an already written sentence. I felt Bear could do this fairly independently. There’s a teacher’s manual that guides you through how to teach each lesson. I didn’t end up using the teacher’s manual very much but just gave Bear the workbook and had her do the various activities. Sometimes, I would hand her the teacher’s manual to check her definitions. 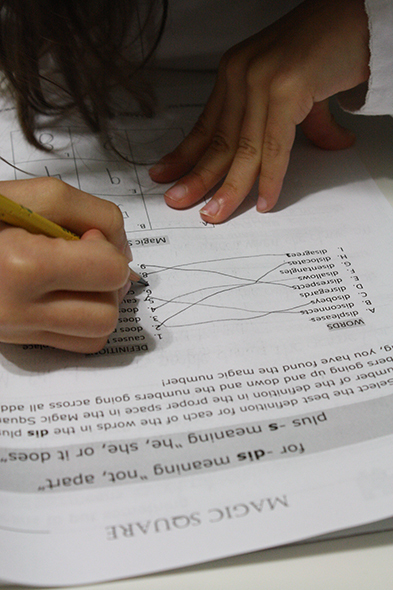 It was a great curriculum for building her independence in her school work. Bear liked it because it feels like a activity book – fun puzzles and such – and thus is entertaining. 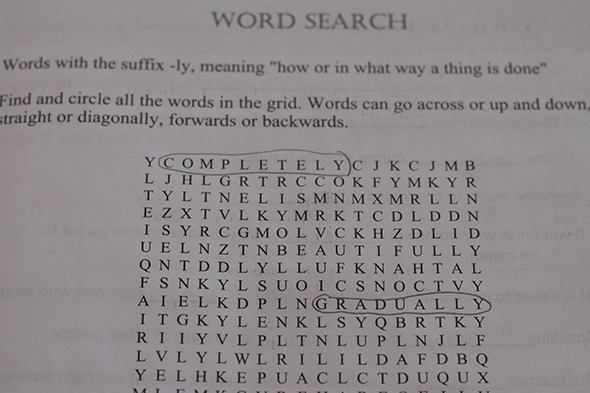 It felt a lot like busy-work, especially the word search activity. I am not a fan of word searches. I think they are a fun thing to do in your spare time, but I don’t prefer them as an activity for learning vocabulary. You don’t need to know your definitions to do a word search. I think a crossword puzzle would have been a better choice of activity. Part of why it felt like busywork is that the words in Foundations Level 2 were words that Bear intuitively knew. I really think I should have chosen the next level up. As I stated, we reviewed Foundations Level 2, but I think she would have been more stretched with Elements Level 1. The Elements levels deal more with Greek and Latin roots. 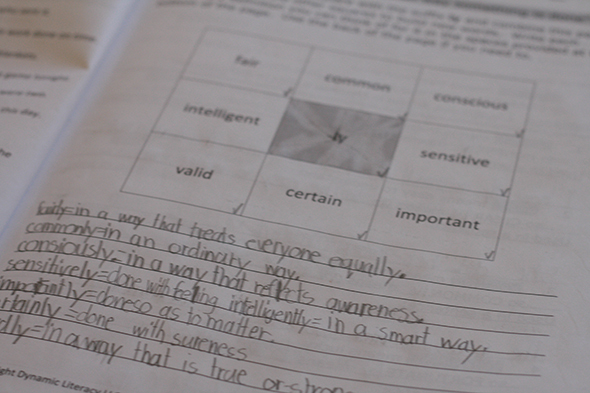 Homeschool Creations also reviewed WordBuild ® several years ago. Jolanthe really liked this for her kids and it may help to read her review as well. She continued to use it and purchased it the following year for her children. I love the concept, but it won’t be on our list of curriculum next year because our days are already too full.I am just realizing that with our study of French, Spanish, and Latin, we really don’t need a separate English vocabulary entity. However, if you need a vocabulary program, I do recommend Dynamic Literacy. It builds word building skills that can be transcribed to any word later encountered, which makes so much more sense than memorizing long lists of words. They also have an online version, which may work better for some families. Disclaimer: I received a free copy of this product in exchange for an honest review. I was not required to write a positive review, nor was I compensated in any other way.